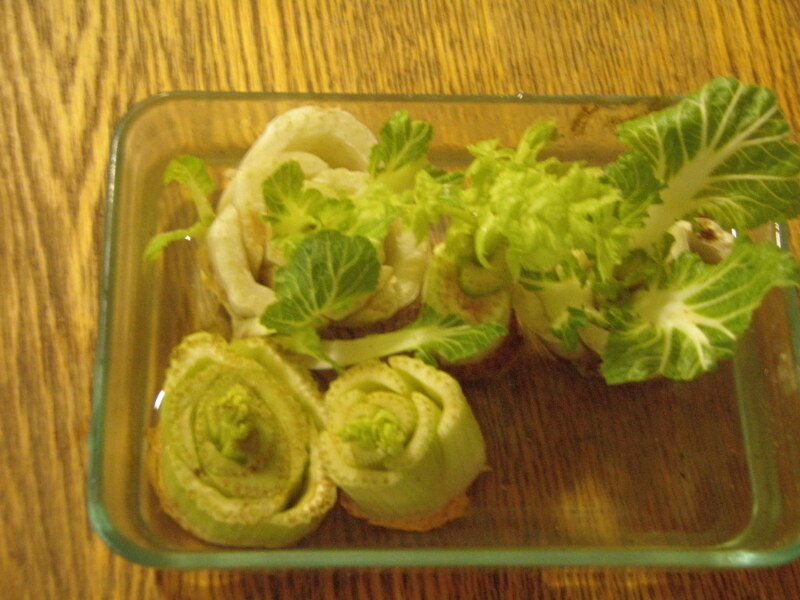 Bok choy and celery in water. Look, I’m lazy; I make no bones about it. There are benefits; as Robert Heinlein was wont to say: “Progress isn’t made by early risers. It’s made by lazy men [and women, says Bee] trying to find easier ways to do something.” I’m not quite sure where I fit on that continuum, as I’m also an early riser and have been since I was a tot. But my point is that I’m always looking for faster, easier, more efficient ways to do things (which gives me more time to do other things as well as read the odd book!). So when I first read about the idea of growing vegetables from food scraps, it sounded to me like a great way to have your food do double duty. After a bit of experimentation, I can now report that this method has had mixed results. According to the articles I’ve seen, you can regrow leeks, scallions (also called green or spring onions), fennel, lemon grass, celery, bok choy, romaine lettuce, cabbage, ginger, potatoes, garlic, dry onions, mushrooms and pineapples. I haven’t tried them all — for one thing I’m highly unlikely to buy a fresh pineapple for any reason — but here’s what I’ve learned about the ones I have tried. Green onions/scallions/spring onions/leeks were very successful. 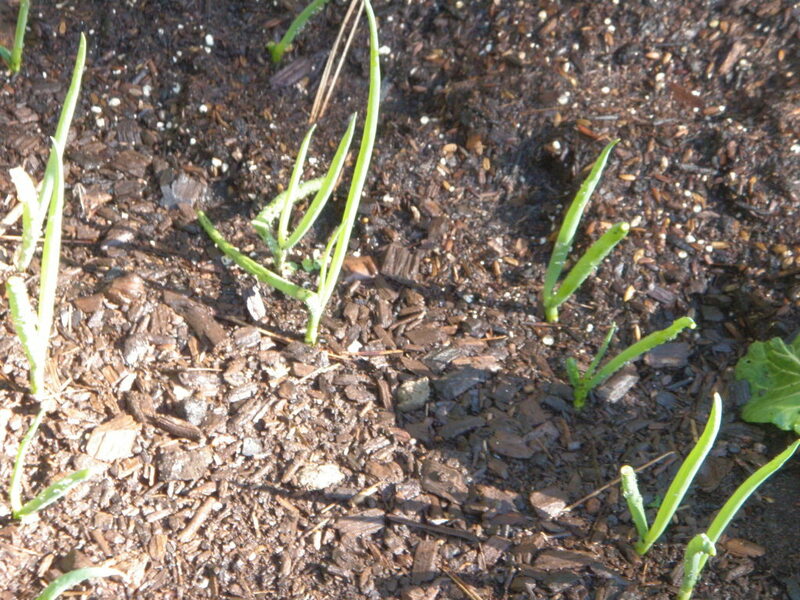 Of the two dozen green onions I replanted recently, 16 regrew. Unlike some of the others, which must be started in water first, these should go straight into the ground. You need about half an inch of the white root end. Although you can keep them in the fridge for a week or so, they’re more likely to grow if you plant within a day or so of using the tops. Keep them moist until you plant and water in well. Cover the root completely, as otherwise the top dries out and they don’t sprout as well. You can also hold these over the winter, at which point they’ll make a small round bulb before going to seed. Bok choy upper left, cabbage upper right, celery lower and far right. I’ve had mixed results with celery. So far all the plants have sprouted after I put them in the ground, but about half just sat there while the other half grew back quite rapidly. None have made big thick stalks yet, but even if they don’t, they’ll be fine for flavoring stew, soups and such. Bok choy has been very successful, probably the best choice of all these if you have limited room and want something you can count on. I suspect chard, with its similar thick fleshy stems, will also do well, but haven’t tried it yet. If you grow celtuce — a plant that’s sort of like a lettuce with fleshy stems — I bet it would also work. Romaine lettuce and cabbage also gave mixed results. The romaine tends to rot unless it’s very fresh. About half the cabbage rotted as well. The cabbage that did grow (you can see it in the picture above) looks as though it’s going to bolt to seed fairly quickly, but it put out lots of leaves that are good for salads and stir fries. Jury is still out on ginger, as it’s a perennial that will take a year at least. All the dry onions I’ve tried rotted, so I may be doing something wrong. You’re supposed to leave about half an inch of the root end and plant straight into the ground. We don’t eat fennel or lemon grass, and I almost never buy mushrooms. Garlic and potatoes, of course have long been staple kitchen-to-garden crops. Separate the garlic cloves and plant in either spring or fall (I prefer the latter). 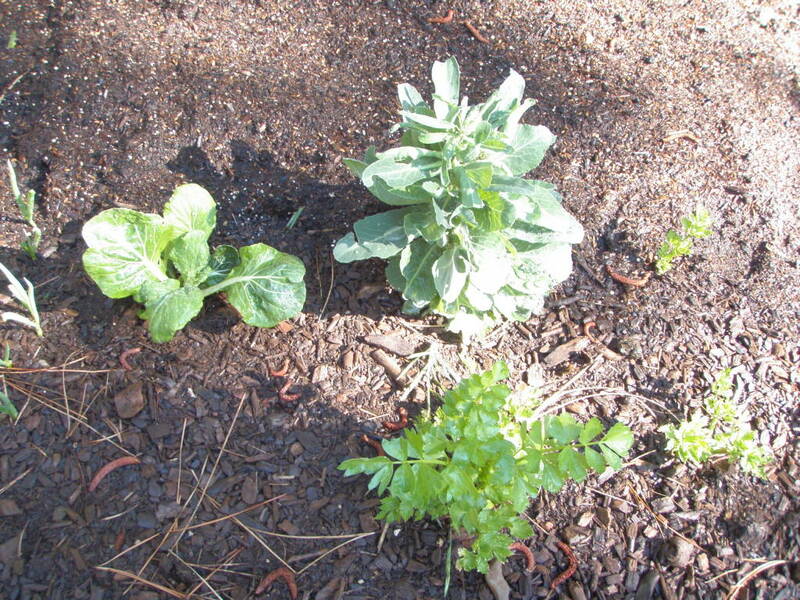 Let the potatoes sprout and plant small whole or cut chunks of large ones. I find it interesting that several of the biennials in this bunch are tending to go to seed when replanted. It makes me suspect that something about the process of being harvested and replanted signals the plant to bolt. If that’s the case, it might be a way to get seed from biennials in a single year, instead of having to hold them over in the garden. This could be a boon to the lazy gardener, as otherwise you have to arrange your garden to hold over your seed plants. If you were doing this with grocery store offerings, it might be a moot point, as those are often hybrids. If you’re replanting your own open-pollinated plants, as I am, then this system could have some unexpected benefits. I haven’t been doing this long enough to make a recommendation, but I’ll keep you posted. The other thought that occurs to me is that I might also be able to force biennial root veggies to seed in this fashion. Carrots, for example, will regrow from their tops, but only the top grows, not the root. I plant to experiment with them as well as beets. I probably won’t bother with radishes, as they’ll go to seed so quickly on their own. Again, I’ll keep you posted. 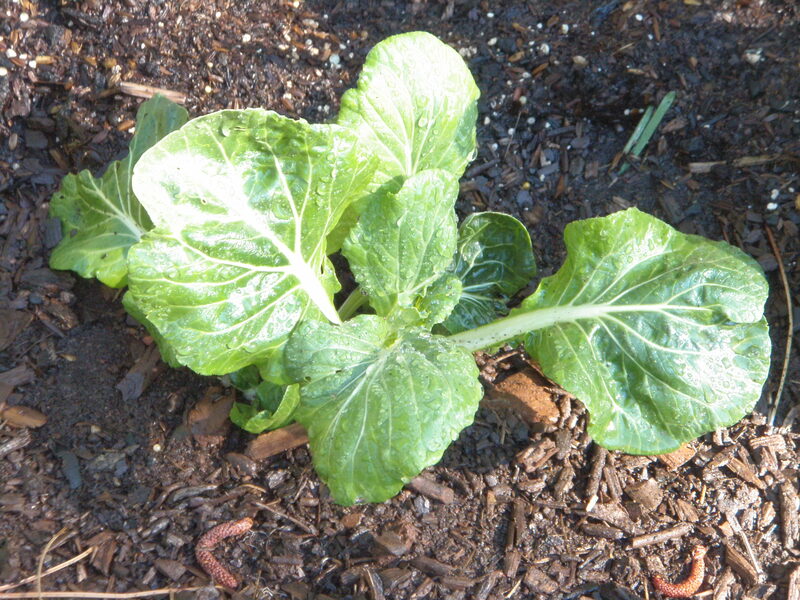 This entry was posted in Farms, Food, Money Matters and tagged bok choy, cabbage, carrots, chard, lazy gardener, onions, scraps, vegetable scraps, vegetables. Bookmark the permalink.